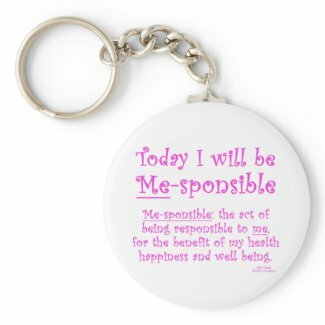 The act of being responsible to ME - for the benefit of my health, happiness and well being. I put it on to t-shirts and mugs and different gifts on my online stores. Since then, I have seen my quote used in different blogs around the internet, and I'm glad that people are finding it helpful in their own personal health quests. That was my intention. Recently, I've discovered even more ways for me to apply the term Me-sponsible for myself, than I originally thought. At first, it was a way to keep my focus on my health quest without letting the influence of others, or taking care of others first, get in my way. But now, I've discovered how much more important it has become for me to keep that focus. I don't want to let the cat out of the bag too early, but I will say, I will be writing a short true memoir account of my story of Me-sponsible, and where I go from here. I hope to have it published on Amazon Kindle and other ebook devices before the end of the year. Along with Ginny's Sacrifice, a paranormal fictional novella, and a few other paranormal fiction short stories.